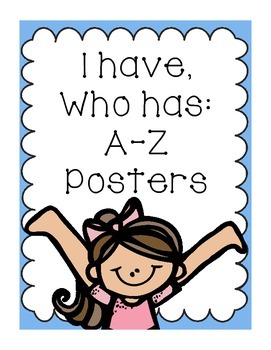 This "I have, Who Has A-Z" Packet includes every single letter in the alphabet with beautiful illustrations of children holding posters with the letters that they are holding. Each poster has the phrase "I have... _____ Who has _____?" If you have never played this game, it requires each child to look for their letter, and ask who has the next letter in the alphabet. Each child gets a chance to recite the letter that he/she has.This game can be repeated over and over again. It's a great way to get your kids involved in a learning game, and have fun at the same time. Next time, ask your kids to trade posters with another. That way, they can get a chance to try out a new letter. Sounds like fun, huh?